- Check the temperature of the wine. - Smell the cork to detect any abnormalities. The decanting operation is a delicate one, which may be necessary when the wine has deposit. Older wines, with more than 10 years, can therefore develop sediment that needs to be decanted. If one chooses not to decant the wine it must be served with utmost care, not tilting the bottle too much. Hold the glass tilting it slightly and pour the wine at a regular pace. Repeat pouring in the remaining cups without putting the bottle in an upright position. 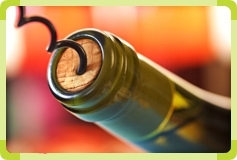 If one chooses to decant the wine following precautions should be taken: Before decanting, the bottle must be 24 to 48 hours in an upright position to get all the deposit at the bottom, after removing the cork, slowly and steadily pour the wine bottle into the decanter/pot (this operation must be performed in the presence of a light source, so you can clearly see the arrival of the deposit). When the first particles appear near the storage bottleneck for the operation, place, with a quick movement, the bottle upright. To serve the wine at the right temperature, often marked on the back label of the bottle, it is useful to have a thermometer. Concerning the temperature at which wines should be served, there are some mistakes to be avoided: white wines should not be stored for long in the refrigerator (cooling white wine in the refrigerator or in a bucket of ice on the day that it is going to be served is sufficient); one should not freeze too much white wine (do not use the freezer) or throw ice in the wine. As for red wine, one should not serve it too warm, the room temperature should be enough. To fully appreciate the personality of the grape varieties and the subtle character of wine, it is essential to use the proper glass. So when one carries a cup to ones mouth, the sense of taste is on alert. When drinking, three messages are automatically sent: temperature, texture and flavour. The wine is composed of different elements: fruit, acidity, mineral components, tannin and alcohol. The combination of the appreciation of smell and taste lead us to the wonderful world of flavour. One should take into account the following aspects for glasses: It should be colourless, transparent, unadorned, thin-walled, thin board, with foot and a good glass. The cup size is important, it enables the display of quality and intensity of aromas, the evaporation space has to be chosen according to the personality of the wine; On the capacity, in general, a glass must have sufficient capacity for 6 to 8 cl of wine, occupying only 1/3 or slightly more by volume (never more than half the capacity), the rest being reserved for the bouquet.